Parent: Could I please have copies of the team roster and snack schedule? Coach: Here’s the roster. We don’t do snack. Parent: Oh, you didn’t print the snack schedule? Coach: No, we don’t do snack. Parent: No, I mean the snack, the snack for after the games. Coach: We don’t do that. We have a party at the end of the season. Parent: Oh. No snack. Really? Coach: Since our games end at 5:45, it doesn’t make sense to have a snack. So, we don’t do snacks. What, no snack? How could we possibly expect our daughters to play in the fresh air for more than an hour, and not provide them with food as they exit the field? Yes, it sounds silly when put that way, but today’s children and parents have widely come to expect snacks at organized youth activities. Now don’t get me wrong. I love snacks. But this organized snack thing has clearly gotten out of hand. Somewhere between our generation’s childhood and parenthood, things went drastically awry. Just a few days earlier, on another field, my son had his first game in Farm League baseball. He went to the field in his play clothes, because we hadn’t received uniforms yet. No big deal – throwing a hat and shirt on down at the field is easy enough. And when my son asked if there would be a make up for the game that was rained out the previous Saturday, I told him I didn’t know. Again, no biggie. We’ll find out when we get there. He also wanted to know how many outs each team would get? Would it be three outs, like in baseball, or would everybody get to bat, like in t-ball? I told him not to worry, we’d know soon enough. Despite the uncertainty surrounding the logistics and details of playing baseball, the snack schedule, interestingly enough, had already been created and distributed. We could all rest assured in the knowledge that some parent would be bringing a “healthy-ish” snack and drink for the team. Phew. Our children would not die of starvation on the way home from the ball field. 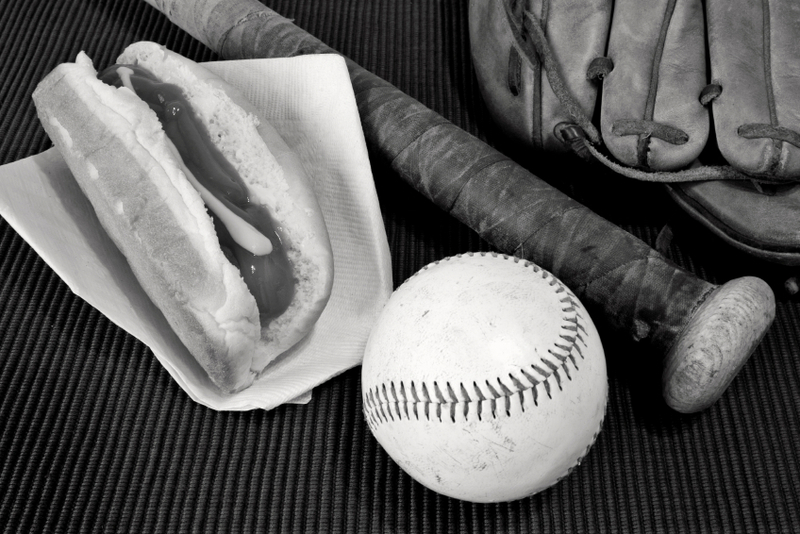 Do you remember the snacks we used to have at our sporting events when we were kids? Nope, me either. I do remember the softball team being very thankful when one of the mothers showed up – usually sometime around the fourth inning – with paper cups and a giant thermos/cooler/jug-thing filled with cold water. And some days we were really lucky. The thermos was filled with iced tea. You remember, the kind made from the sugary powder that gets scooped out of the can. These drink donations were never scheduled. They just happened. Sometimes, however, two mothers brought drinks on the same day! Other times no drinks appeared and we were forced to drink from the water fountain. Heaven forbid. But it didn’t matter to us. We were too busy playing to worry. My brother played in the Little League. After each game, players received a cup of soda at the snack stand. I know soda is on the evil foods list these days, but really. Are those foil drink packages we pass out that much better? Several years ago I watched a rerun episode of Everybody Loves Raymond that was built on the team snack theme. Deborah had forgotten the snack, and at the last minute she pulled together a snack from items she had in the house. It turned out that the perfectly acceptable items she sent, were not on the “approved snack list.” For the next fifteen or so minutes viewers were indulged in the humor of the typical Barone antics. It was funny – a real classic. And in the final scene Marie, in her quest to “out-do,” showed up at the game with a full spread – table cloth and all! On television, it was hysterical. In real life, not nearly as amusing. At 8:45 one Saturday morning I arrived with my two kids at Field #1 – just as we were instructed. Within a few minutes, I found myself staring with my mouth wide-opened as I witnessed parents from another team walk onto the field with folding tables, coolers, coffee urns, table cloths and many, many goodies. Surely Marie Barone must have been involved. However, within a few minutes, people began to notice that there were three teams assembling on Field #1. I’ll admit I didn’t know all the rules of t-ball, but I was pretty confident that a t-ball game involved only two teams. When we arrived at the next field, a fourth team was waiting. Our coach informed their coach that they had indeed read the schedule correctly, but their game location had been changed. He pointed them in the direction of Field #1 – the one with the Breakfast Buffet set up along the third baseline. All this snack insanity has me wondering. What is the purpose of the organized snack, and how did it become such an ingrained part of organized youth sports? And how, with the media constantly bombarding us about the childhood obesity problem, does this custom still exists? Perhaps someone a few years back thought teams should celebrate and bond by sharing a snack after a game. Maybe. But from what I’ve seen, snack is rarely a team experience. Rather, it is more of a “one for the road” situation. In fact, having just vacuumed my mini-van, I can assure you, every last snack ever given to my kids was eaten in that vehicle. Are parents concerned that our kids might starve to death before we get home from the field? I don’t know. My daughter’s coach had a pretty valid point. When you examine the schedule, just about any schedule, most games are played either right before, or right after a meal. So fear of starvation shouldn’t be the reason. Will kids only play if they are rewarded with a snack at the end of the game? I suppose, in some cases, that could be true. However, is a bag of supermarket popcorn really that enticing? Wouldn’t movie theater popcorn with “butter flavored topping” provide greater incentive? Or ice cream, even greater? OK, bad idea. That violates one of those parenting rules, the one about not using food as a reward. Then what would be an appropriate reward? Wait a minute. Why is it that we have to reward kids, for playing? Isn’t the fun of playing supposed to be its own reward? Or maybe, just maybe, the snack is really for the parents? No, not for the parents to eat. (Marie Barone’s Breakfast Buffet, as bizarre as it was, is the exception, not the rule.) But rather, could it be that the purpose of the organized snack is to give all the parents a chance to contribute? With a team snack schedule in place, no parent is left behind. Every parent gets her or his chance to be snack lady, or snack man, and thus feel like a contributor. After all, why should the coaches and referees get all the glory? I suppose this is an awful lot of analysis on a topic as silly as snack. Bringing a snack to a baseball game once a year isn’t that big a deal. But it is, however, just one more little thing to complicate our already busy lives. And come to think of it, is it really just one more little thing? We also have to bring the snack for the soccer team. Times two kids. And Sunday School. Again times two. Oh, and there are the snacks we send to school for standardized testing days. Again, healthy-ish. And we won’t even count the celebratory snacks for Halloween, Thanksgiving, Valentine’s Day, Cinqo de Mayo, birthdays, half-birthdays, etc. So when I’m waiting in line at Wal-Mart with two 12-packs of popcorn and two 10-packs of juice boxes in my shopping cart, rather than anxiously review my mental To Do Lists, I will treat myself to a few moments of daydreaming. I’ll reminisce about a time when parents felt less compelled to micromanage, and kids just played. I read this article and found it very interesting, thought it might be something for you. The article is called Stop the Sport Snack Insanity and is located at http://www.imperfectparent.com/articles/stop-the-sport-snack-insanity/.